An Evil Empire Has Risen and the Lylat System is in Danger! 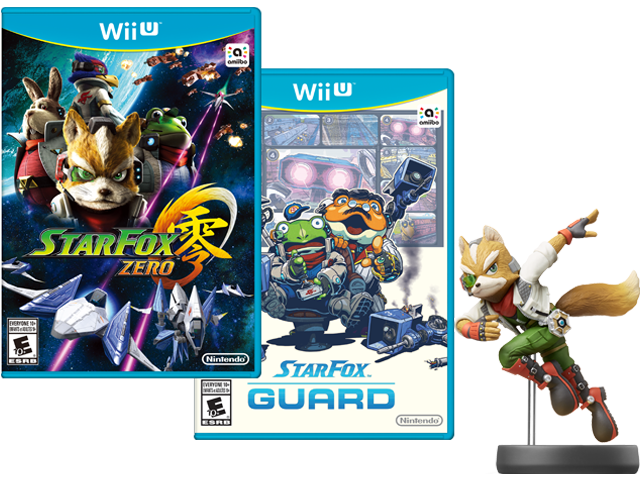 This bundle includes Star Fox Zero, Star Fox Guard, and a Fox amiibo! As legendary space pilot Fox McCloud, blast through an onslaught of enemy forces to bring peace to the galaxy. In this white-knuckle space shooter, it'll take more than luck to master the Arwing jet, the Gyrowing flight drone, and the Landmaster tank! You have what it takes. Now prove it. General Pepper needs your help! Use your TV's cinematic view to fly and identify targets and see through the eyes of Fox with the Wii U™ GamePad's screen as you lock onto enemies and fire. You'll also have to use advanced flight techniques like boosting and barrel rolls to survive the relentless assault. With the help of the rest of Team Star Fox , tackle missions in the air and on the ground in a variety of planets teeming with enemies. Then engage vast armadas of powerful ships in outer space dogfights. Master your craft, defy the odds, and earn your face-to-face meeting with Andross. Only you can restore peace to the galaxy!